Appearing on CNN Wednesday morning, Tallahassee mayor Andrew Gillum, the Bernie Sanders-endorsed Florida Democratic gubernatorial nominee, reaffirmed his support for abolishing the U.S. Immigration and Customs Enforcement (ICE) and implementing universal health care in the Sunshine State. BERMAN: —Ron DeSantis, the Republican nominee had a statement last night about you, Andrew Gillum. He says, you, want to abolish ICE. You do, correct? 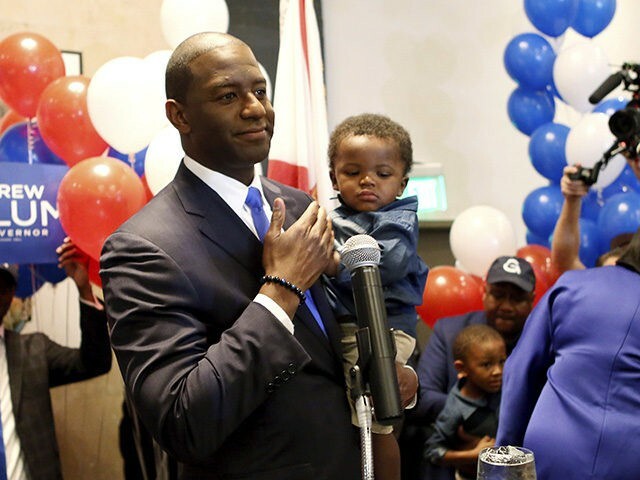 GILLUM: —An entity that’s not been tarnished in the same way as ICE has. BERMAN: So, yeah. He says you want to abolish ICE, you say you want to replace it. That’s basically the same thing. He says you want a billion-dollar tax increase. He says you want [a] single-payer health care system in Flordia. You do want Medicare for all, correct? GILLUM: I am a champion for treating health care as a right and not a privilege. That’s absolutely right. And expanding Medicaid in the state of Flordia for over 700,000 people, who right now don’t have access health care which costs this state about six billion in federal money that should be coming to Flordia that right now is being distributed to other states. But, I happen to believe it’s not left, or right, or center.